Maidh Kshatriya Swarnakar Society has activated Maidh Trust Scholarship 2019 Online Registration Form for all those contenders from economically weaker sections who want to complete their professional courses (B.E., B.Tech, BCA, MCA, 5 Years Integrated Law Course, MBBS). 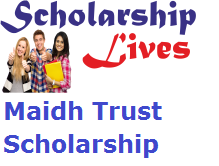 If you are also one of them whose profile match with this eligibility criteria they all fill Maidh Trust Scholarship Form 2019 before the last date through the link which is mention below. Eligibility Criteria for this scholarship. Applicants musts have secured 60% or above marks in the previous exam . If the contenders discontinue studies during the session for which he/she is getting the scholarship, he/she must immediately inform the Maidh Kshatriya Swarnakar Society of the same. The trust will take into contemplation a number of other factors, besides the academic record, while making the final shortlisted of scholars. Trust decision on the award of the scholarship is final, no correspondence in this regard will be entertained. 9 candidates (5 girls and 4 boys) will get a scholarship grant worth INR 45000 per year. Step 1: First of all the get the application form and fill it according to the rules. Step 2: then fill all the complete details on applicants name, present and permanent address, phone, date of birth etc. Step 3: then Provide information on college address, full educational details, two reference details, etc.